Say “movie trilogy” and most people reach for Star Wars or Lord of the Rings. A few of us might mention Kieslowski’s Three Colors trilogy — three thematically related movies set in modern France and Poland. Red Riding is a new trilogy that fits somewhere in-between genre films and art films. The titles of the films are The Year of Our Lord 1974 (1974 for short), 1980, and1983, but the Red Riding films were produced within the last couple years and released in 2009 (2010 here in flyover country). They are set in their respective years in Yorkshire, England. In each film, a seeker after the truth is frustrated by police corruption and obstruction. The movies play a bit like HBO’s The Wire. They are intricate, realistic dramas that incorporate stories from both sides of the law. Characters come and go, including a few who appear in all three films. Red Riding ’s Yorkshire is a detailed universe. If you only watch the first film, you’ll marvel at how well textured it is, and I’m not just referring to the preternaturally smoky atmosphere. There is substance to the texture if you watch all three, because some of the details end up being plot points or repeated themes in the next two movies. For example, in the first film our truth-seeker is a journalist investigating the murder of a little girl found in a red mack. He interviews the police and pretty quickly sees that they’re not doing nearly enough to solve the case. Two rogue cops eventually beat and humiliate him, then turn him free with a loaded revolver. I didn’t ask why they would arm him before releasing him, I assumed it was an invitation for suicide, or an invitation to retaliate thus giving the cops an excuse to shoot him, or even just a plant. I trusted the movie completely. By the end, we see the fate of the gun and what the journalist did with it. The next film reveals more about the fate of the gun — answering questions we didn’t even think to ask — and also some other things that happened that we didn’t see. Red Riding is based on a quartet of novels (the filmmakers skipped1977). Each film was made by a different director using a different medium (16mm, 35mm, and HD digital video), which raises the question of who the auteur is: the writers (David Pearce wrote the novels, Tony Grisoni wrote the screenplays) or the producers. I’d say it’s a little of both. The stylistic differences are very surprising. 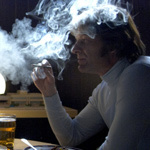 The thick coating of smoke in the first film, along with the wild hair and wide lapels, call to mind another era, dangerous and a little isolated but recognizable. The second film not only looks cleaner, but is about an internal affairs officer sent to shine a little daylight into corrupt workings of the Yorkshire PD. Things are still dangerous and isolated, but it’s a new decade and things are starting to change for the better. The third film practically feels modern, with clothes and hairstyles that don’t seem too dated. There are bad people in Yorkshire, but it doesn’t seem so deadly any more. The poor seem poorer — the low income housing is now run-down and graffiti-covered. As the world gets safer, the men get softer. The seeker in the third film is the least manly of the protagonists, a chubby solicitor, a bachelor who just lost his mother and who seems not to have finished growing up. His investigation isn’t about reporting the truth or uncovering corruption, but rather fulfilling favor to a friend of his mum’s. Of the three, 1983is the least satisfying. It does a lot of wrapping up and at times I found it hard to remember which sense of closure I was supposed to experience. Ironically, all that closure should have made it the most satisfying. Between 1974 and1980, it’s a tossup. The first film stands on its own as a slice of life in a small, remote police department. Think Zodiac, but grittier and with a more reasonable running time. If you never saw the other two, you could be satisfied with1974. But 1980 really widens your horizon. You’ll be amazed at what you didn’t know in1974. Playing the game of connect the dots is very satisfying, and it couldn’t happen as a standalone movie. But after investing more than 3 hours in the first two films, you might as well treat yourself to the conclusion. You’ll be immersed, engrossed, and outraged, but you won’t be sorry. A word of advice: give yourself a little break between the films. If you see them in one day, have a bite to eat and a conversation with your friends between movies. You need to let them sink in. Or watch them as a miniseries, on consecutive days.